The accuracy of measurements depends on many factors, such as measurement techniques, accuracy of measuring equipment, selected measuring points, and mounting method. 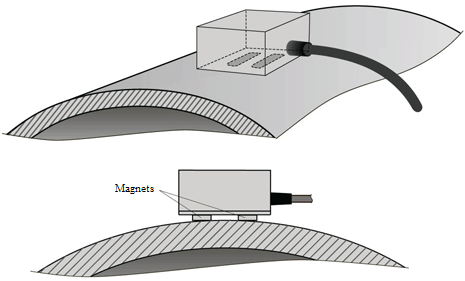 This section provides recommendations for mounting the vibration sensors and seismic receivers. with flange with screw holes BC 1313; intermediate material or pins are often used for securing in soft soil. 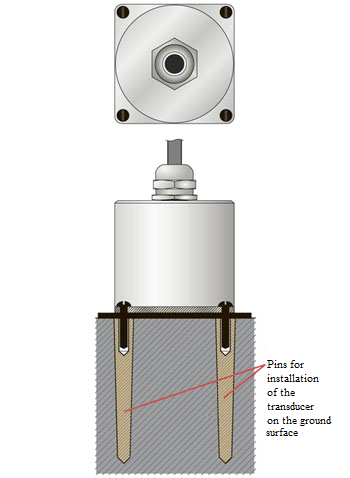 When installing the sensors on a threaded stud, the deviation from perpendicularity of threaded hole against the mounting surface shall not exceed 0.1 mm. The roughness of the tested object’s surface must be no worse than Ra 3.2, and nonflatness – no more than 0.05 mm. For research at over 10 kHz frequencies, apply a fluid lubricant onto the contact surface. Mount and dismount the sensors with mounting hole for M5 stud only manually without any tools. Attach the sensor cable to the analyzed object in immediate proximity to it using a staple, duct tape, mastic, or any other means. When dismounting a sensor attached to an object, shear it with scalpel under the base instead of applying lateral impact.